This is an addition to a feature that appears six stories below this one, the “Seattle Now and Then” about the 1911 visit of the steamer Suveric at Pier 56 (Or Pier 5 before the renumbering during WW2. For more on this renaming check out Part One of the Waterfront History posted on this blog-web.) 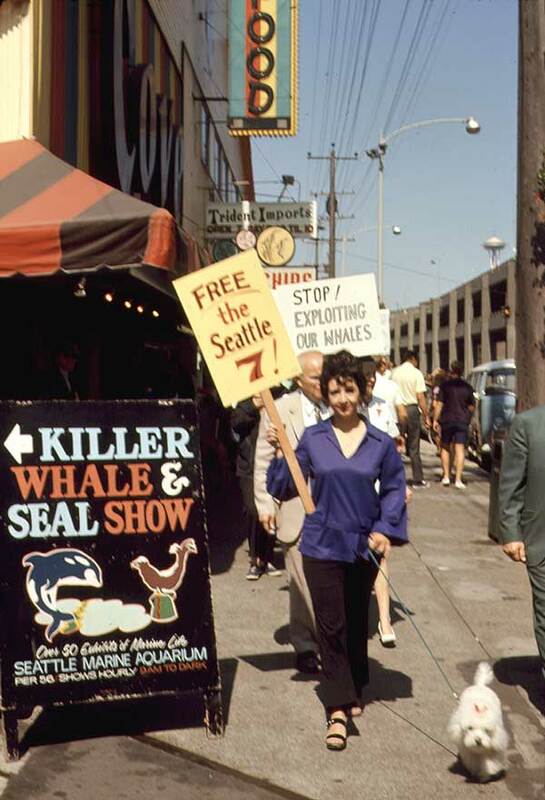 That posting also recalled the Seattle Marine Aquarium that opened on the pier for Century 21 in 1962 and carried on into the ’70s. The walking photographer Frank Shaw is also responsbile for this slide taken on the sidewalk beside the pier in 1970. There are two causes getting broadside attention here. Behind the woman with the poodle someone is protesting the aquarium whale show at the other end of the pier. The woman in blue inspecting the photographer is demanding the release of the Seattle Seven, most of whom were University of Washington students (and one professor) whose protests over the Vietnam War put them in court and ultimately in or on a prison farm for a few months for contempt of court. The students that is. The professor never served any time. You can read Walt Crowley’s summary of this on historylink. For even more, Google Seattle Seven, but don’t be mislead by that other “Seattle Seven” – some group of businesses that would never have been cast into or onto a prison farm.